An Expedition 36 crew member captured this view of the interior of the Automated Transfer Vehicle-4 after the hatch was opened on Tuesday. The robotic European cargo ship Albert Einstein was opened Tuesday morning (June 18) at the International Space Station, a day late because of concerns that mold may have grown inside the vehicle, NASA officials said. The unmanned Einstein spacecraft docked at the space station Saturday (June 15), but it was not opened Monday as planned due to worries that the vehicle and its cargo had not been disinfected properly before launch. The opening of the spacecraft's hatch was moved back a day to allow the space station partner nations to discuss the situation; ultimately, the partners agreed to have the station crew disinfect 21 bags of cargo on the spaceship to ensure they were clean of mold. 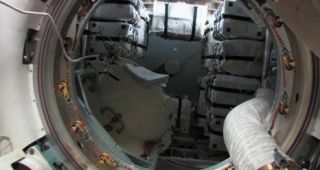 Furthermore, the Russian concerns might have been focused on the documentation of the decontamination procedures rather than flaws in the procedures themselves, according to NBC News space analyst James Oberg. "It's a well-established principle of spaceflight safety that, under uncertainty, you don't 'assume the best,' you make sure the worst cannot be true," Oberg said, according to NBC News. "And if you're not sure you decontaminated these items to rigorous standards, then you do it again, to make sure." Tiny lifeforms aren't unheard of on the space station — in fact, they're often launched there on purpose for scientific experiments. One study on the International Space Station between 2006 and 2008, for instance, found that Salmonella bacteria grown there in microgravity were more virulent than their counterparts on Earth. The Albert Einstein spacecraft, also known as the Automated Transfer Vehicle (ATV)-4, is making the second-to-last of five unmanned cargo delivery flights to the station planned by the European Space Agency. The spaceship, about the size of a London double-decker bus, was packed with food for the crew, science equipment and spare parts for the orbiting laboratory. It lifted off from Europe's spaceport in Kourou, French Guiana June 5. Like the other ATV ships, Albert Einstein is disposable; it will burn up on purpose in Earth's atmosphere after leaving the station. Six astronauts currently live and work on the International Space Station: three Russian cosmonauts, two NASA astronauts and one European astronaut from Italy, Luca Parmitano. Parmitano was especially looking forward to Albert Einstein's delivery of some Italian space food delicacies, such as tiramisu, that he's planning to share with his crewmates. "Apart from the experiments, oxygen and water, ATV-4 also brings personal clothing and food, among which of course the culinary art of Italian cuisine will be a cherry on the cake," Parmitano wrote on his blog hosted by the European Space Agency. "There is nothing like the promise of an Italian dinner that I will offer from my personal supply to entice my colleagues to work quickly and well!"